Portable Endoscope Camera's | Myriad Fiber Imaging Tech., Inc. 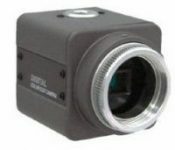 This CCD camera is an ultra-compact cased, VGA, USB 2.0 camera with a 1/3” color CCD. It features 90fps, hardware and software triggering image capture, digital zoom and a feature-rich user based menu setup and control. This CCD portable camera is used with a USB, it does not come with software all options are on the camera itself. Some specifications of the camera include: 410,000 Pixels at 768(H)x494(V) NTSC & 752(H)x582(V) PAL.